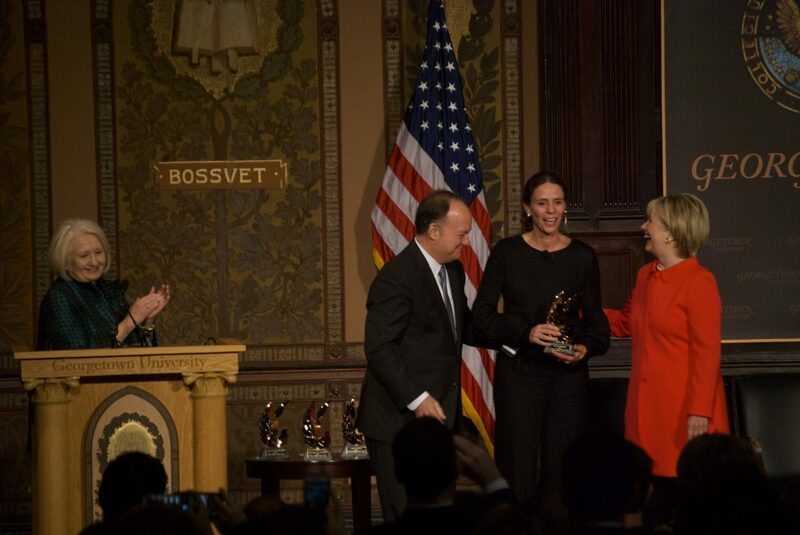 Former Secretary of State Hillary Clinton presented the annual Hillary Rodham Clinton Awards for Advancing Women in Peace and Security, hosted by the Georgetown Institute for Women, Peace, and Security (GIWPS) in Gaston Hall on March 31. 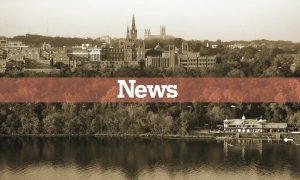 Clinton outlined the importance of opening opportunities for women to fully participate in peace and security negotiations in front of over 700 Georgetown students and guests before honoring the recipients with her namesake award. She presented the award to four Colombians who played a pivotal role in the 2016 peace agreement that ended half a century of war in their country: Humberto De la Calle, lead negotiator for the Colombian government and former vice president of Colombia; Maria Paulina Riveros, co-chair of the Gender Sub-Commission and deputy attorney general of Colombia; Elena Ambrosi, thematic director of the Office of the High Commissioner for Peace; and Jineth Bedoya, a journalist and advocate for victims and survivor of sexual violence. All four were crucial to ensuring that an agreement with the FARC, Colombia’s largest insurgency group, specifically included women’s issues and protection for victims of violence and sexual violence during the conflict. Clinton’s opening remarks touched on the current administration’s cuts of international health programs in its proposed budget and warned against diminishing the United States’ role as a leader in peace processes across the world. Clinton did not mention President Trump by name or reference her unsuccessful campaign directly, but elicited laughter from the audience when she joked about “alternative” facts and her use of studies and research to back up her claims. After the presentation of the awards, Ambassador Melanne Verveer, executive director of GIWPS and Clinton’s former chief-of-staff, moderated a discussion with the four honorees. When asked about their greatest pride in the peace process, Bedoya, who continued reporting on the conflict even after she was kidnapped, raped, and tortured by FARC forces, emphasized the visibility it brought to women’s suffering in Colombia. The recipients acknowledged the challenges that threaten the agreement in the present and future, including its rejection by Colombian voters in an October 2016 referendum, but they remained optimistic that the unprecedented inclusion of women in the negotiations would continue as an example of success for inclusion. 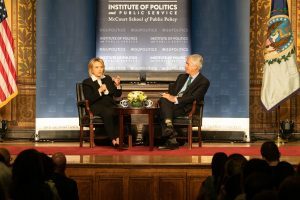 Many students were initially attracted to the event because of Clinton’s appearance, but the stories and achievements of the honorees impressed them just as much as the former presidential nominee. Some students began camping outside Healy as early as 10:30 the night before the event to secure their spot in line. Ava Rosato (COL ‘20) waited in line for over nine hours before the doors to Gaston Hall were opened. “There was a lot of excitement about Hillary’s presence, but also combined with the peace agreement [negotiators], it was just incredibly powerful all together as an event,” Rosato said. Karima Nodine (COL ‘20), who waited for ten hours, said that she attended the event at first to see Clinton speak, but was drawn into the stories of the honorees as well. Clinton concluded her remarks by addressing Georgetown students like Rosato and Nodine directly, giving the students and the current administration the choice of turning away from the rest of the world and its struggles or continuing the United States’ leadership role in matters of peace and security for all.